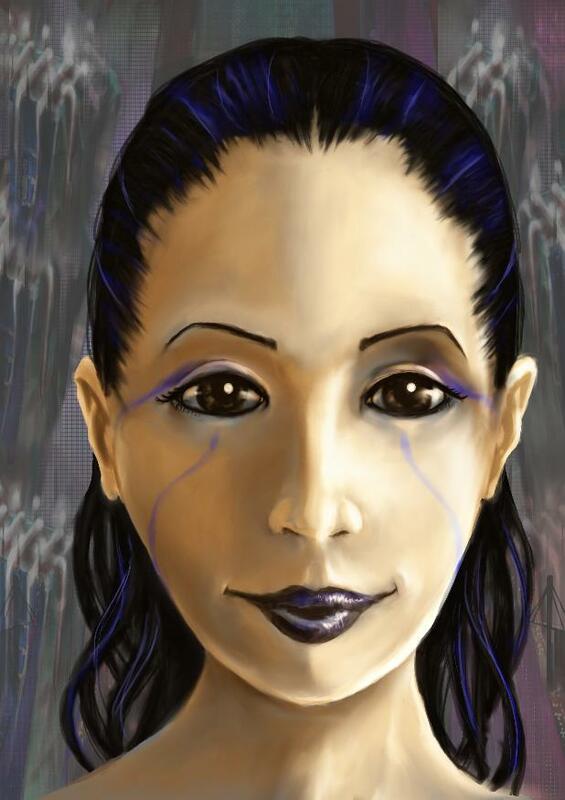 This is a full portrait painting tutorial using GIMP. 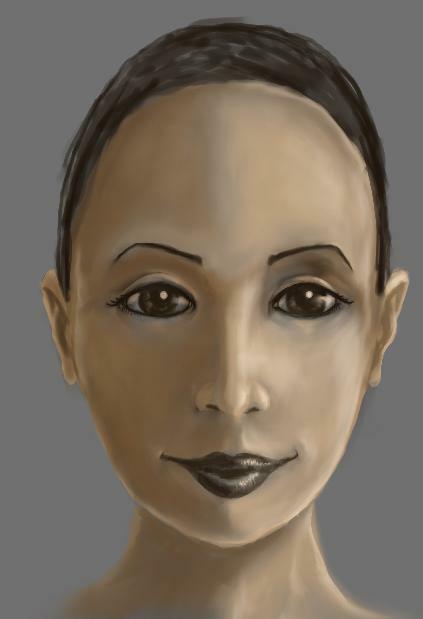 Following it step by step will hopefully teach you a fair bit about human anatomy and how to paint, mainly using GIMP's airbush and smudge tools. These are invaluable skills if you want to create your own character artwork, design game concepts, make your own online comics and many other things. If you manage through this, you will have tried a lot of different techniques for yourself and should be able to try another character on your own. Expect it to take some time though, this is a rather extensive tutorial that will take some time to complete. Take your time with each step and don't expect to finish this in one sitting. 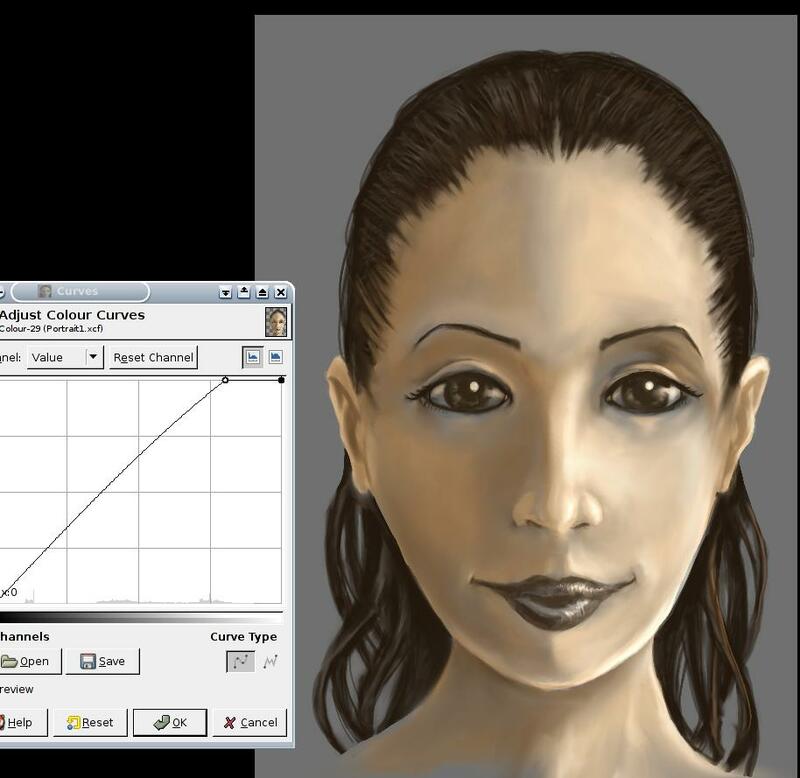 Follow the general workflow of the tutorial, but create a character of your own. This is more difficult and you might not get as much out of the tutorial this way -- since you have to concentrate on other things than the tutorial intends, making a lot of design decisions I have otherwise done for you already. But of course the very act of planning a full portrait is a useful exercise in itself though! Recommended for more experienced painters, but even if you are it's really instructive to follow someone else's work now and then too -- you find that others do things differently than you. 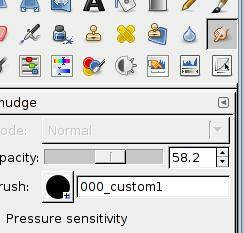 You need to have resizable brushes set up. It also helps to have GIMP set up to help your artistic work. 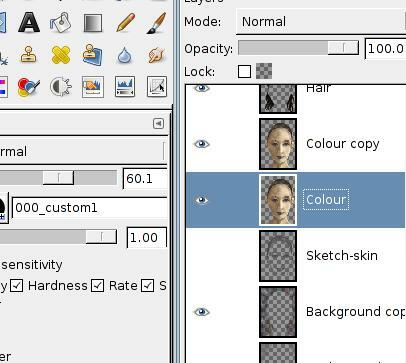 You can see how to do that here: [Setting up GIMP for artistic work / basic airbrushing tutorial]. We will be using only the hard round resizable brush for this image. I painted this with a drawing tablet, but it can be done also with a mouse, you only need to work slower and more carefully. It's strongly recommended that you learn the keyboard shortcuts for the various tools. You don't want to move the cursor away from the canvas more than necessary. Ink pen (shortcut k) -- This is used for the rough sketching. I use this instead of the brush tool for sketching only. Set a 45 degree angled round tip, set size to 10 and the opacity to 80% . For tablet users:The ink tool is a very versatile instrument when using a tablet. Set all sensitivities to 1.0 for the sake of this tutorial. If you have tilt sensitivity, make the pen tip a perfect circle instead -- angling the pen will create the fountain-pen effect anyway. Airbrush (shortcut a) -- This tool is the primary painting tool used in this tutorial. 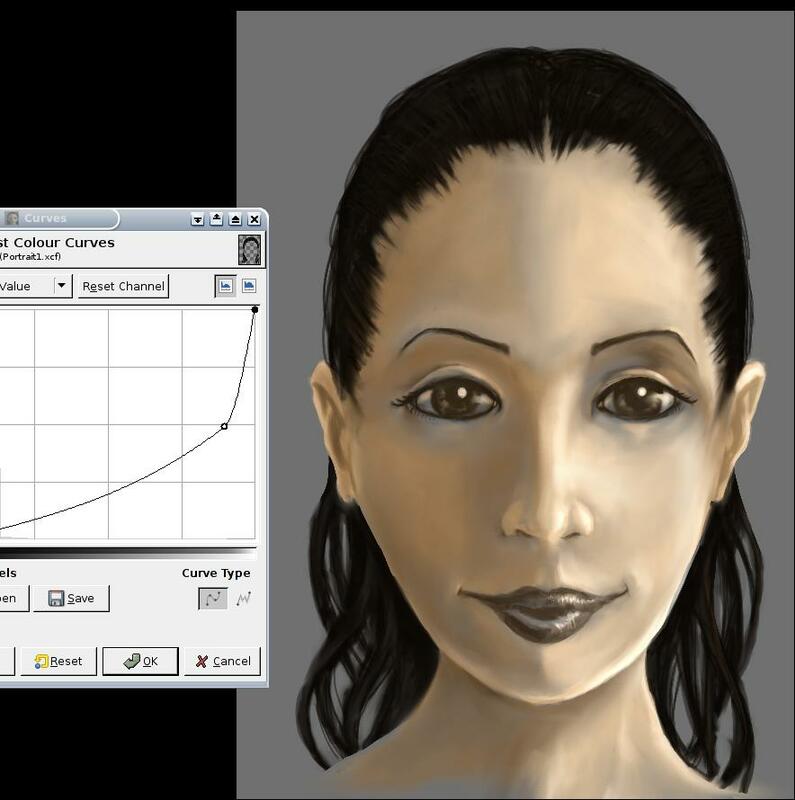 Note that the airbrush will allow you to create a range of colour values in your image without actually changing to a darker colour See the basic and Advanced airbrushing tutorials on more info on this. Set the opacity of the airbrush to 20% (! ), the rate to 80% and the pressure to 10%. 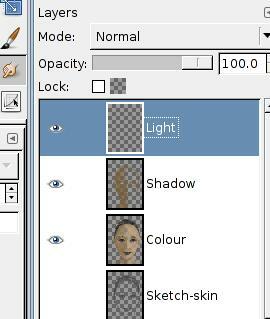 For tablet users: Set all sensitivities except colour. Use an opacity of 80% instead, remember to use a light hand to apply the strokes. 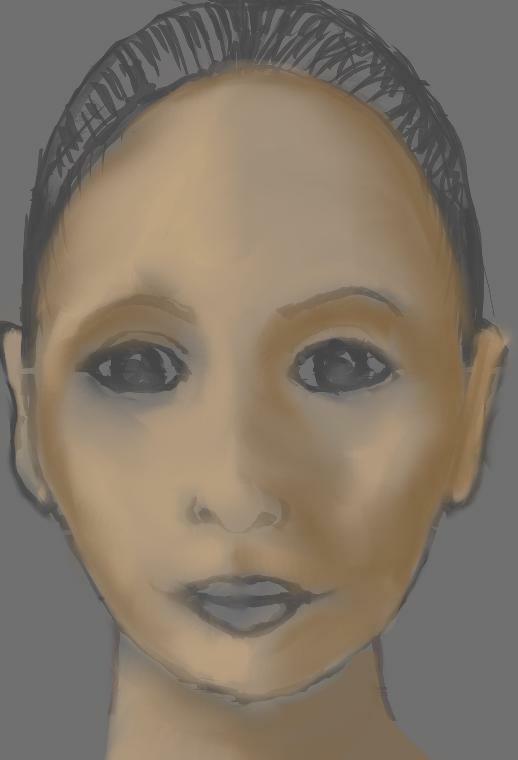 Smudge tool (shortcut s) -- This tool works like pulling existing colour on the canvas, a little like dragging your finger in wet paint. It's essential in order to create smooth blending without using any filters. It is used excessively in this tutorial, since you use it to create skin. 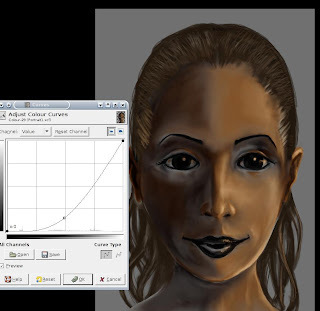 In order to achieve more subtle effects for this tool, you need to lower the effect of it. Set the opacity to 60% and the rate to 50 too. (no settings are different for tablet users). The Advanced airbrushing tutorial also includes the use of this tool. Refer to this tutorial if you have trouble. The eraser (shorcut Shift+E) -- This is a very important paint tool in its own right, but not so much used in this tutorial. Except for the obvious use of deleting mistakes you can use it to skulpt the shape of the head. To make it more nuanced, set the opacity to 80%. For tablet users: Set sensitivity to opacity, you will find the eraser becomes much more useful (although harder to handle) that way. Be ready to turn off this sensitivity now and then when you really want to erase something completely. 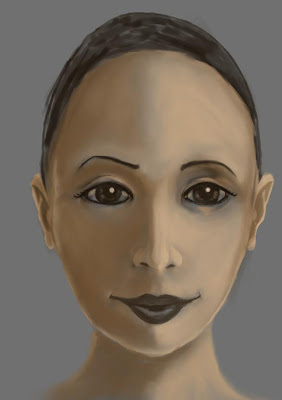 The tutorial is divided into several sections; Sketching, colouring, light&shadow, Hair and final composition. All thumbnails are clickable and I really recommend you take a look at the big version to see details of the work. Begin by creating a new image 2480 x 3508 pixels wide (that's an A4 at 300 DPI, you need that much if you want to print at some point). 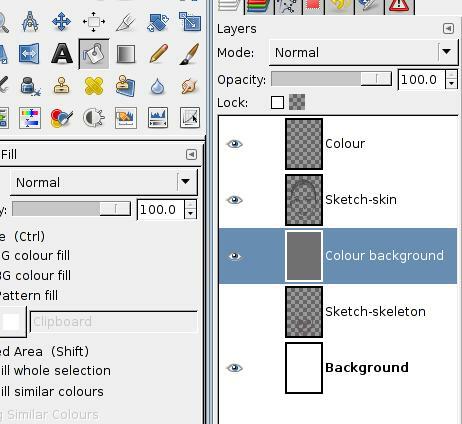 I worked in GIMP 2.3.15 when doing this tutorial, there should be no real difference for users of later versions of GIMP. Create a new transparent layer and name it Sketch-skeleton. 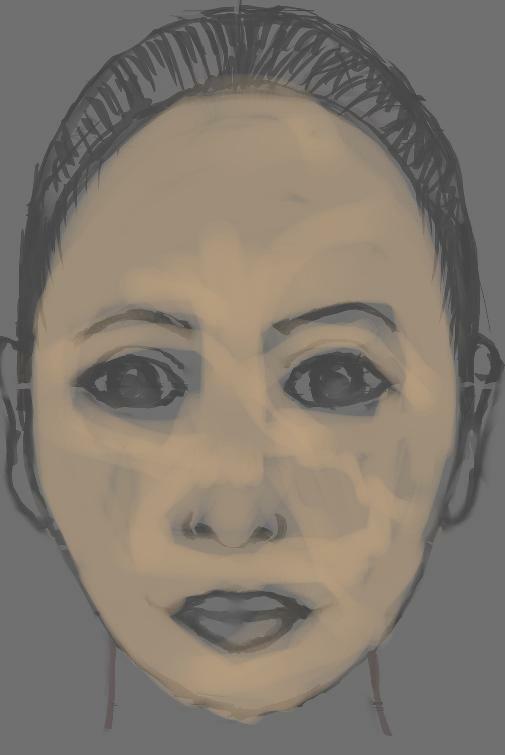 Above that, make another layer proportion lines and above that again, a layer Sketch-skin. Humans have very different real sizes of their faces, but the proportions are rather similar and is what we are really seeing. Of course, many people (and many memorable fictional characters!) deviate from these ratios; these are only some sort of average. But it's good to know them, so you know what most people look like. Work on the proportion lines layer with the ink tool. 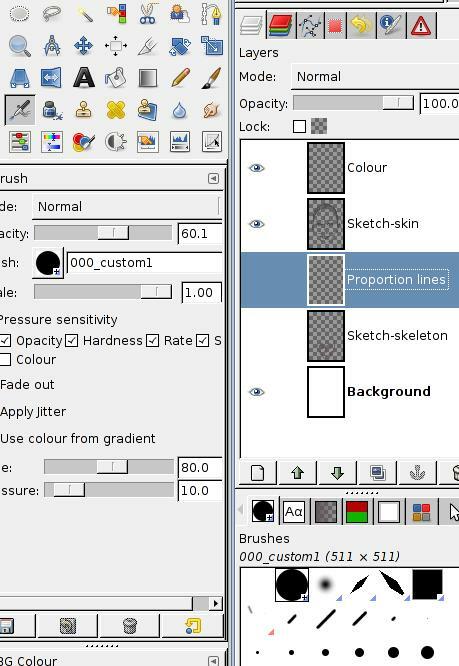 Choose one dark gray colour for all sketching and stick to it. Draw a line through what will be the center of the face. Make an oval split in the center by that line. Make a horisontal line in the middle of the oval. 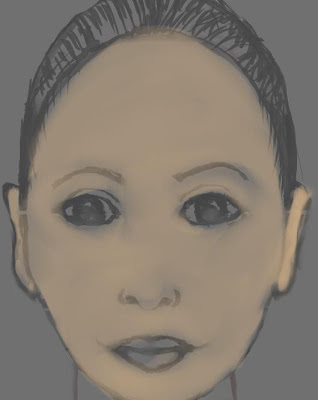 Along this line the eyes will be located (Marked 1/2 in the right image). You can use GIMP to make nice straight lines, but as you can see I have not. Make another line about 1/4 up from the chin. Around here should the tip of the nose be. Some way down from this line is the mouth line (marked X). Along this line the opening of the mouth should be. Mark the hairline just as high down from the top as the mouth was from the bottom (distance X again). It often helps me to make a skeleton to see roughly where things should go. I don't know why, but it's somehow easier to see how things relate to each other with a skeleton. So head for the Sketch-skeleton layer and pick the airbrush. Lay out a very rough skeletal head. You don't need to be too exact, but at least things will be roughly in the right places, especially around the jaws, and how wide these must be (this is often neglected in manga for example, but we are aiming for a realistic head here). 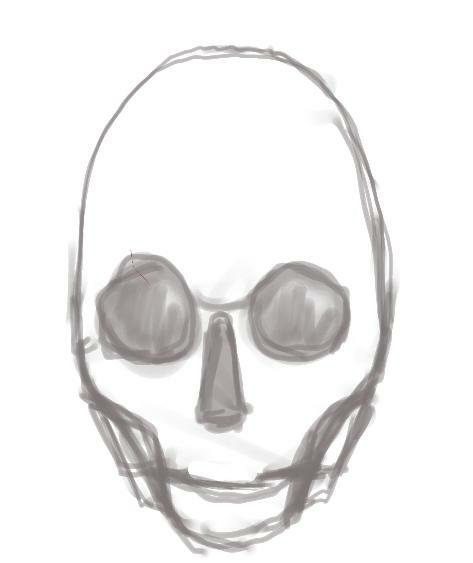 Using the skeleton and proportion lines as guides, pick the ink tool again and work on the Sketch-skin layer to make outlines of the features of the face. 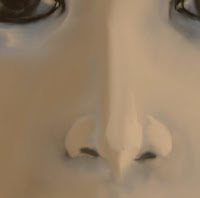 The eyes are placed on the eye line (1/2 of the face height). To know how wide apart they should be, you should remember that one eye of the same width should fit in between them. 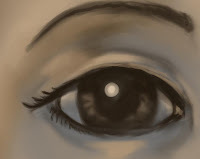 If you have problems with sketching the eyes, look at my example, or take a look at my Draw an Eye in five minutes tutorial. The eyebrows start at the inner edge of the eye or slightly inside and stretches the length of the eye. They are very important in showing expression. 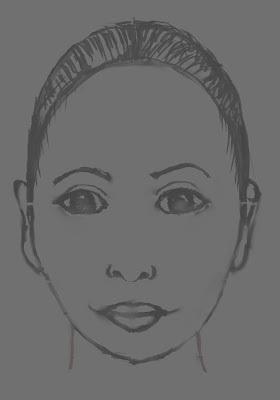 Here I've aimed for a rather neutral look, but a minor change in eyebrows can easily make her angry, afraid or surprised. Keep checking with the skeleton now and then, but also hide the layer to get a view of what you are doing. The nose starts in between the eyes. Remember that this is actually a protruded ridge. I have slightly shaded this in my sketch, you don't have to, but you should remember that the ridge is there. The nose stretches to the nose line, where you will have the bottom lines of the nose. The nose is hard to paint in ink. 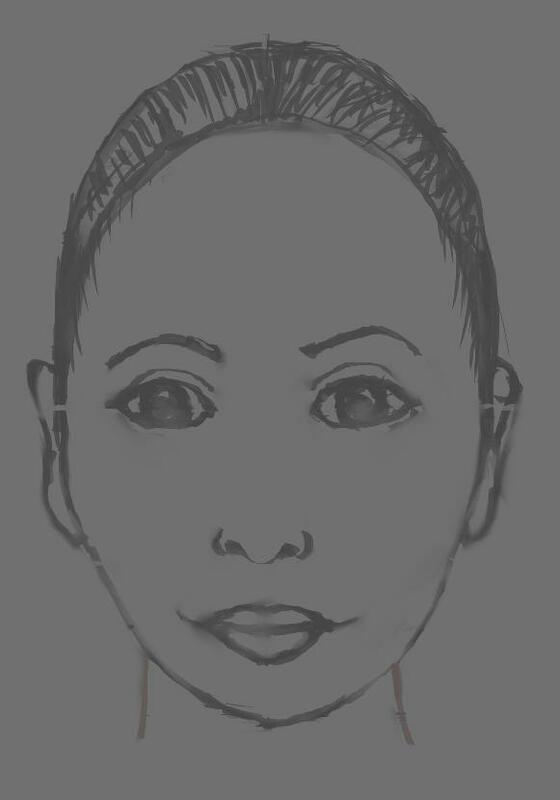 This is because the ridge of the nose has no folds and so must be shaded, not outlined if you want to show it. We will do this in colour later. The nostrils are usually visible on women seen front-on for some reason (research actually tells us we actually see this features as beautiful in a woman, but not in a man. A man also often has a lower, sloping nose where the nostrils are not seen straight on). Note that nose is a sort of triangle which is widest near the mouth. Down there it's a wide as the inner edges of the eyes. If you need more help with getting the nose right, why not have a look at my Anatomy 101: Drawing the nose tutorial. 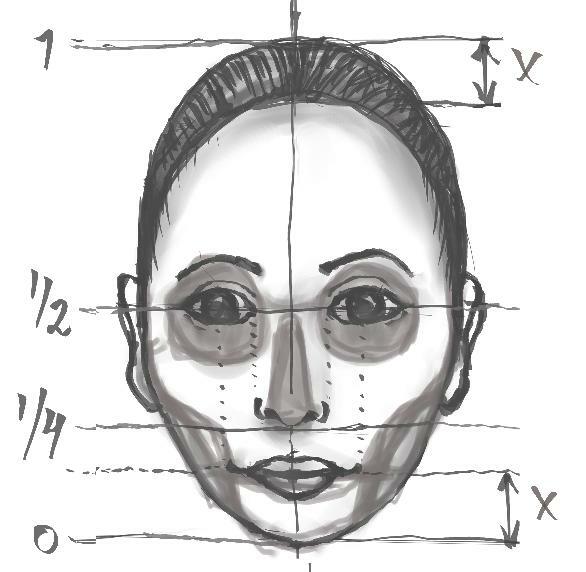 The mouth is lined along the mouth line (distance X from the chin). The corners of the mouth is located right under the iris of the eye when looking straight ahead. Check with the skeleton layer so that the teeth really fits inside the jaw -- widen the head a bit if needed. 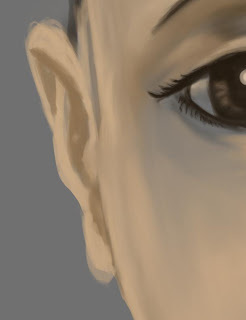 The ears start a bit above the eye line and extends almost down to the nose line (this varies a lot, also with age since ears tend to sag down the older you get). I have made some simple shades in this sketch, these are not used later. Hide the proportion lines and skeleton. Create a new normal transparent layer Colour. This is where most of our work will happen. Without the lines, this is how we are for the moment. The sketch is now done. Kinda rough, but we will eventually erase this sketch anyway, so we don't care. This is how it should look. From now on we will be working on the Colour layer, not disturbing the sketch anymore. Work on the Colour layer until I say otherwise. Almost all work will be done here. Pick the airbrush, scale up the brush and apply a faint yellow-ochra colour over the face. Avoid eyes and mouth for now. 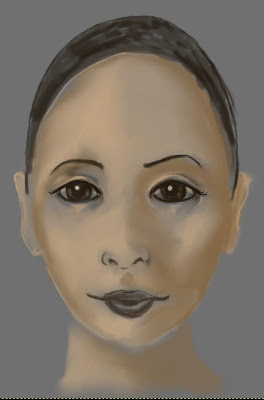 Choose the smudge tool and make sure the colour is applied evenly over the face. Notice that the colour layer has 100% opacity, the only reason I can still see the sketch is that I have been careful not to splotch too much colour with the airbrush. Remember, the airbrush's opacity is your friend. Use it. Here I covered the ears as well. I did the neck too, before the next picture. We need to get a feeling for the 3D-form of the head. I choose to have the face side-lit (a classic light condition) and start sketching the shadows with a darker brown-yellow colour. Side-light is a rather simple light-direction I picked to make it simple. More interesting light will add considerably to your work. 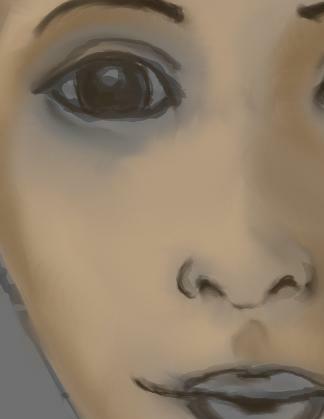 Note how sketchy my brush strokes looks here. 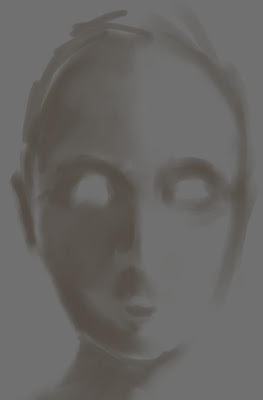 Work quickly and try to imagine the 3D-form of the face, that's the most important part. Pick a slightly brighter shade and apply the bright side of the face too. At this point you are essentially only "mapping" the light, only consider this as rouch layouts. This image was just a pedagocial way of telling you to pick the smudge tool. Smudge the bright and dark areas into the mid-values. Be careful to not overdo it -- you don't want to smoothen it so much you're back at the beginning again. 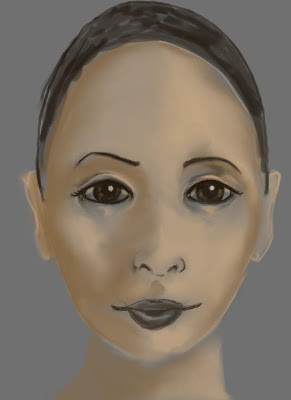 Try also to keep sections of mid-value here and there (like in the center of the forehead). At this point the image has 3 colours -- dark - mid - and bright ochras. So far we have had the sketch to guide us. It's time to start the process of making us independent of that. 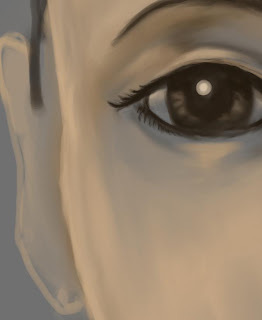 Begin by transferring the lines of the sketch to the Colour layer using a small airbrush. Do the eyes, eyebrows, bottom of the nose, the mouth and the outline of the hair. Since we want realism, smudge the transferred lines subtly into the skin with the Smudge tool. Move in short strokes along the length of the line to blend it while also keeping it well defined. You can try with the Blur tool too if you feel adventureous. Hide the sketch layer and this is what we have. Looks kinda bleak, but that's the way it is. Switch back the sketch layer a few times if you think you're missing something. But once that's done, the sketch is never used again. Enhance the contrast around the eyes with the airbrush. 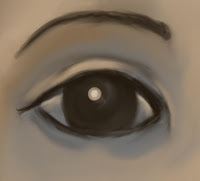 For the general treatment of the eye, see the Eye tutorial, but that does not treat colour. Once again you have to be aware of the 3D-form of the eye and the function of the eyelids. The dark cajal around the eye is maybe not really realistic if we were to make a "natural" looking girl, but it sure helps in an image like this. Note that no pure blacks nor pure whites have been used -- only light and dark browns. We save such extremes for small highlights much later. The upper eyelid has been lit up a bit, so has the lower. There are a lot of folds around the eye, and you can define a lot about a person's heritage only from the eye. 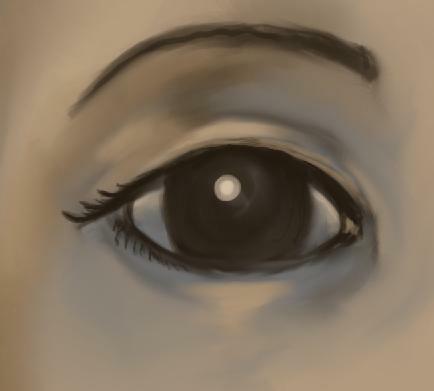 Here I went with a brown, warm eye. The iris need not be very clearly drawn, you won't see the little "stripes" in it for example at this distance. Continue with the other eye. A very critical thing to do when painting a portrait is to flip the image. This is done with Image->Transform->Flip Horizontally. I have a shortcut only for this so I can do this check. Here we can see that something looks off when we flip it. The face looks skewed, the mouth seems to be placed off to the side. 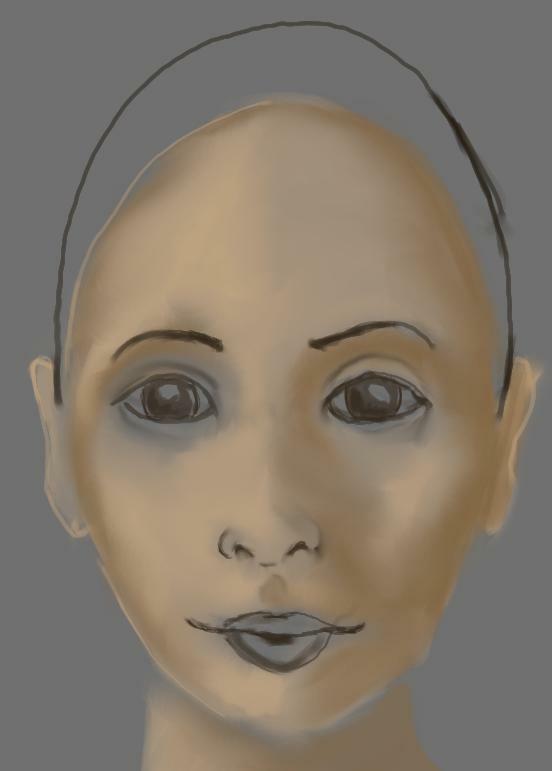 Since we laid out the proportion lines in the beginning it's unlikely the head is really skewed. So why does it look off then? 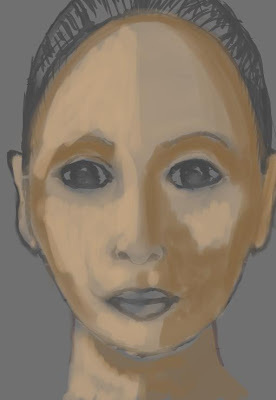 The main reason is that the shadowing is wrong -- one side of the head is brighter than the other and that lures the eye into thinking there's "more" of the face there. Secondly, the nose ridge is not well defined -- the center line is not clear anymore and thus it looks like the base of the nose if skewed. Here I have re-established the center line with light, using the same light and dark shades as before. 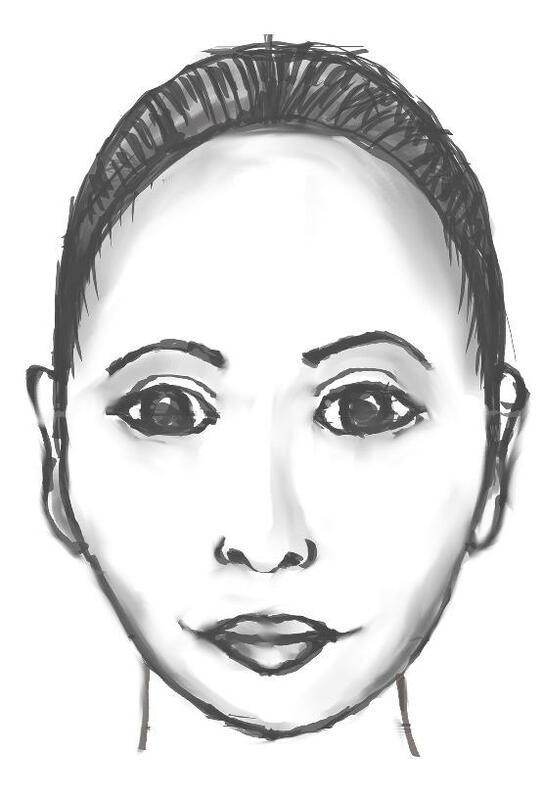 I have moved her left cheek bone to where it actually is -- this evens the face. I have also darkened one side of the face completely. The face looks much straighter again-- and I haven't moved any actual features at all, only changed the light. This is how important light truly is in an image like this. Another reason the image is still a bit skew is that the hairline is not really even. I didn't fix that here -- the hair will handle that later. Now take this refined light-dark structure and smooth it together again, with the smooth tool as before. Work the in the colour of the nose. Only the nostrils are really dark. The 3D-structure of the nose is not easy. I can only recommend you follow my lead here and then go take a look at my Anatomy 101: Draw a nose tutorial. Further help can be had looking up a book on anatomy. There is a reason many comic artists almost skip the nose, it's very hard to draw B&W while making it look good -- it requires shading. The upper lip extends from the bottom of the nose into the mouth. There is a vertical "ridge" along it that is pronounced differently between different people. Some have almost no such ridge, others have a lot of it. 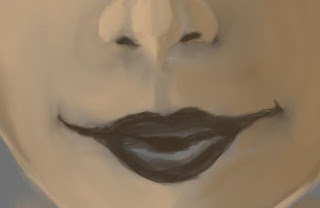 On a classical "female mouth" such as this, that ridge ends in the little bend at the top of the mouth. For now, leave the lips themselves be and only blur in the skin around it, making its shape as good as possible. With light colour, outline the edge of the head. It goes in a bit by the eyes, this is the top of the cheek bone. The 3D form of the ears are, as for the nose, tricky to describe in a few sentences. They also look rather different from person to person. Once again, just follow my lead here, and check out an anatomy book for seeing examples of ears from other directions. With this, we have laid down the basic colour of the picture. Now it's time to do more direct shadow and light. We have already begun making shadow and light effects on the colour layer, but we were then also experimenting with form. Now we start applying darker contrasts however, on top of the already defined form. Create a new layer Shadow. Set it to mode "Multiply" and give it an opacity of around 50%. Apply a dark grey to the shadow layer. 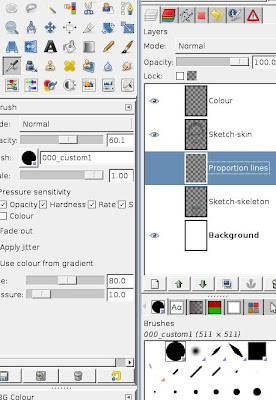 You see how the layer looks to the left (but of course you work so you see all previous layers, like the image on the right!). What you do at this point is enhance the shadows you already have, establishing a global light. With the shadows on its separate layer you can also easily experiment with them -- this is the main motivation to why we didn't do this on the colour layer as well. Try to increase the opacity of this layer for example, to immediately make the image more dramaticly lit! Create another layer, named Light. 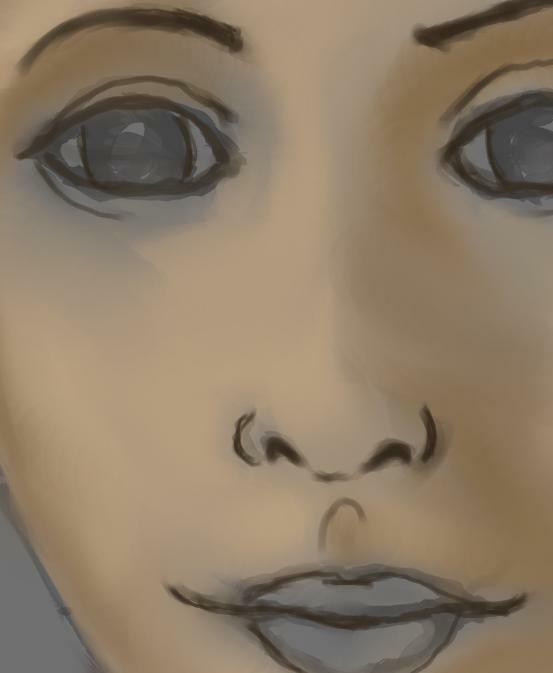 This is a normal 100% opacity layer. Apply brighter highlights in scribbles along the lit side of the face. 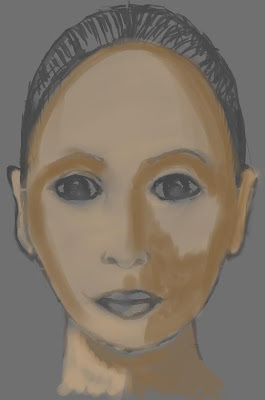 Highlights are not applied as broadly as the shadows were -- since the skin is rather reflective, (although it's not high-gloss), you get a slightly higher specular effect. Note that we are still not using any bright whites here. As a side note, take a closer look at the vertical bright line applied along the cheek. This is the actual form of the cheek closest to us. This means that the skin to the right of this line is actually the side of the head that happens to be visible from this angle. It's leading back to the ears which are actually located far behind the nose, mouth and eyes (just consider that you wear eyeglasses over your ears). 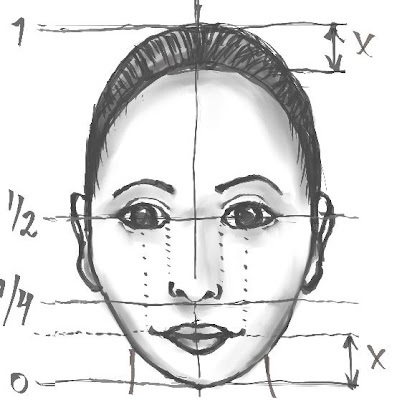 It's important to remember this depth effect when drawing a face straight on -- all parts of the face that we see are not on the same distance from us. After all, the human head is not just a flat surface with ears at the edges, like we do when drawing a smiley face as kids. Use the smudge tool to blend the highlight into the skin. So this is what we have now. I adjusted the hairline a little on the sides to make sure the head was relatively even. The hair will handle that next. Create a new normal layer. Call it simply Hair. Work with airbrush on this layer. I opted for a rather conservative haircut since I wanted the forhead to show (besides I often do more extravagant haircuts, so it was fun to do something more "normal"). I felt the left version made her head look too boxed in, so I cleared all hair from around her ears and made it combed backwards instead. Note that having the dark hair behind the chin is a very useful tool for adjustingthe face. In the right image I have made her cheeks less round since I felt it fitted better with the haircut. Once again, flip the image back and forth often, so you catch weird things happening when you introduce things like hair -- it's easy to make things uneven and strange-looking ... and just as easy to stare yourself blind to such mistakes when working. To make hair, I just used the airbrush with a medium-brush, applying it in short strokes over and over and over. 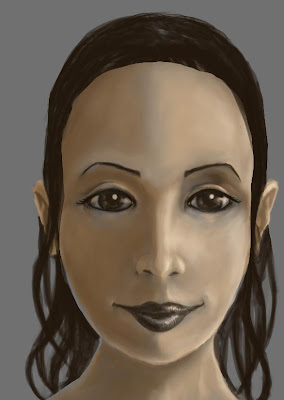 The forehead hairline was done with the airbrush and smudge tools interchangeably. Remember to work from dark to light when doing hair. Start with dark brown, make some sections a bit brighter, then make a few strands with even brighter strands. I made this haircut very strict, but otherwise it's useful to have some stray hairs hanging around, done with a very thin brush. The basic portrait is all but done. Now we compose and tweak it for the final outcome. Save a copy of your work this point (Use File->Save a Copy), so you can return to this point if you're not happy later. Most of the hard work is done, now for the final touches. Once you have saved away your copy, hide all layers except the Colour, Shadow and Light Layers. 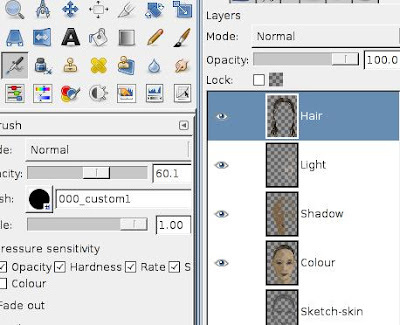 Choose "Merge all visible layers" to make these three into one layer. You have to do it this way (instead of "merging down"), since the Dark layer has mode "multiply". Merging down this layer will destroy the multiply information (make it normal-mode) and change the look of the image. 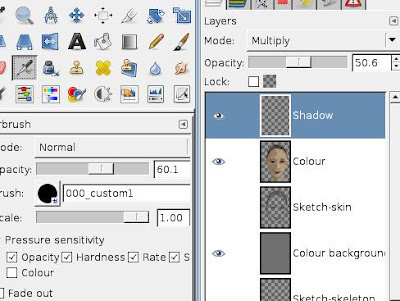 "Merging all visible layers" on the other hand will not change the look of the image when merging. 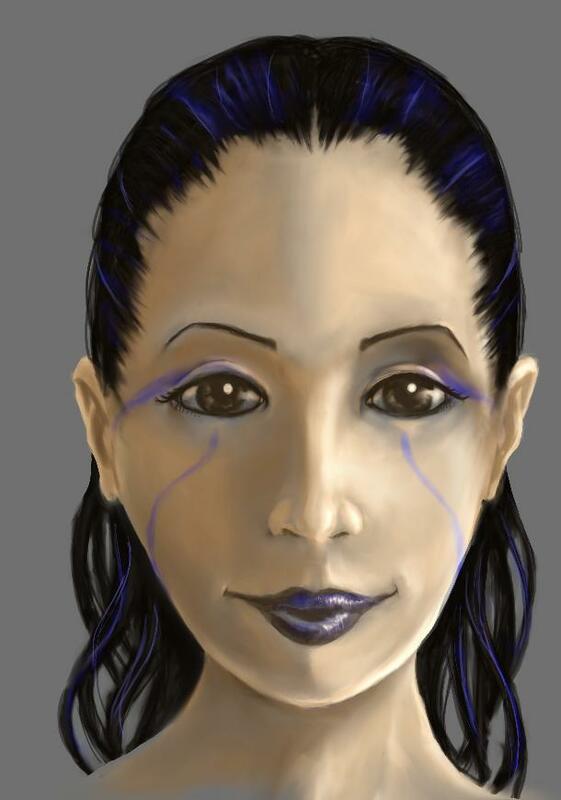 Now you can show the Hair layer and the background layers again. Choose the just merged layer and the Adjust Colour Curves tool. Choose to have it operate on the "Value" channel. This tool will adjust the values of your layer, from the current values at the bottom to the resulting value on the left. By making kinks in this curve you can thus make currently bright colours come out darker or brighter. An example of a darker adjustment is seen on the left. This is an easy way to create characters of any nationality and ethnicity. Our girl could maybe pass as an Egyptian or similar, but her bone structure is not really made for that. Still, it's a very useful thing to be aware of. The right picture has taken the current image and made all bright colours a little brighter. This enhances the contrast and gives her a somewhat "powdered" look that I will be going for. I decided that her hair needed to be darker too, to fit the face. So choose the Hair layer and use the Adjust Colour Curves tool to tone it down in value. and give colour to the lips. I chose to make them blue. To make her a little more interesting I decided on some facial tatoos. The airbrush can be made to easily make such things on the Colour tint layer. I also created some interesting blue mascara. Since almost black hair does not feel the effect of the "Colour" mode, we have to create another, normal-mode layer in order to create the blue streaks in her hair. These are just small strokes with the airbrush. For a final touch, we enhance the light even further in the image. Make a copy of the Colour layer (this is the merged layer of Light, Dark and Colour) and set this colour copy layer to mode "Overlay". See the Light and mood tutorial on my details on this procedure. As can be seen in this image I also created a layer behind it all to fill with a background. I based this of an unpublished image of mine I had lying around, sliding it, dimming it and making it as unobtrusive as possible. I also erased it under her head so as to avoid it shining through anywhere. All the time I kept the grey original background. With background fitted, this is the final image. Note how the "overlay" layer makes her look more saturated. ... And we're done! If you followed all the way to this point, congrats! I made some more small changes after this; changed her mascara somewhat and tweaked her hair a bit, but nothing that changes the steps of this tutorial. My final outcome can be found here and in a bigger version here. Phew, it was quite a lot of writing this, hope you got something out of it and have the time to try this for yourself. If you haven't done images like this before I'm confident you will learn a lot by following these steps.